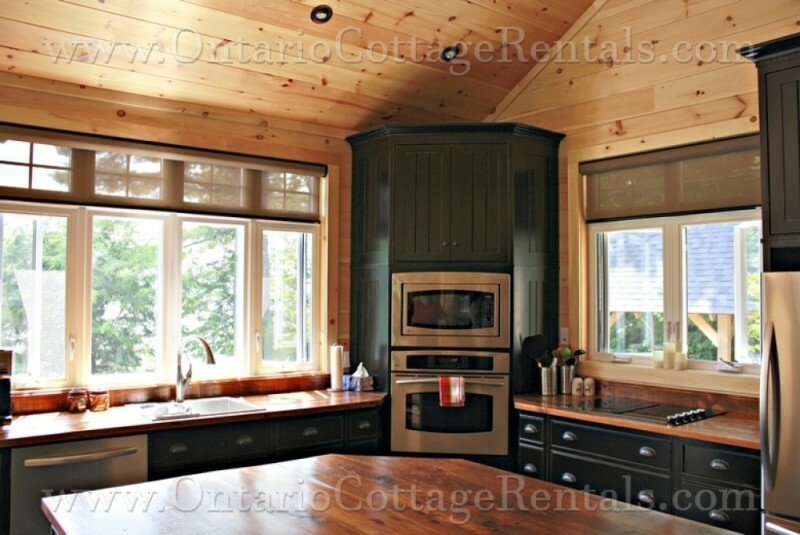 Are you looking for a cottage that offers a peaceful retreat along with modern luxury? This newly constructed open concept cottage is sure to please with hardwood flooring (in-floor heating) vaulted ceilings and large windows looking towards the lake. 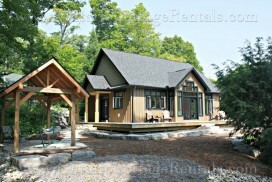 The property is 12 acres and surrounded by Crown Land ensuring privacy. The grounds have been professionally landscaped, and the shoreline has been left to its natural state, attracting many different types of wildlife. 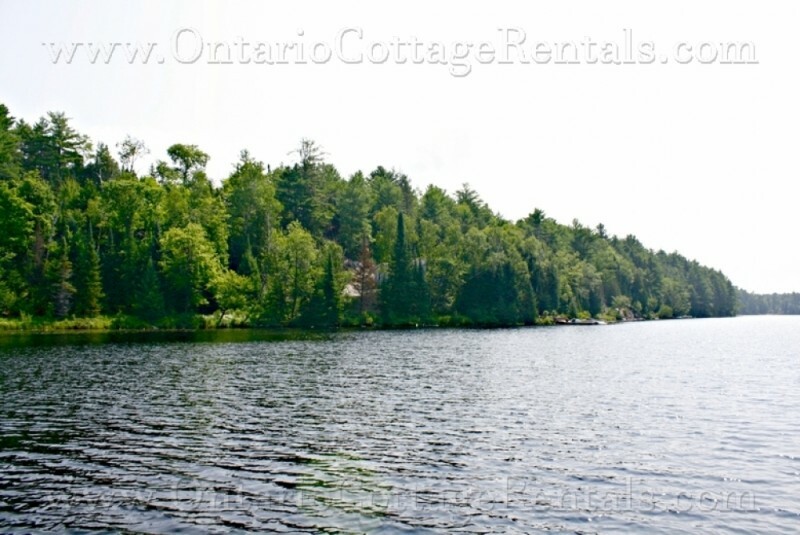 This small lake is quiet and pristine and your family will love time here experiencing "cottage life". 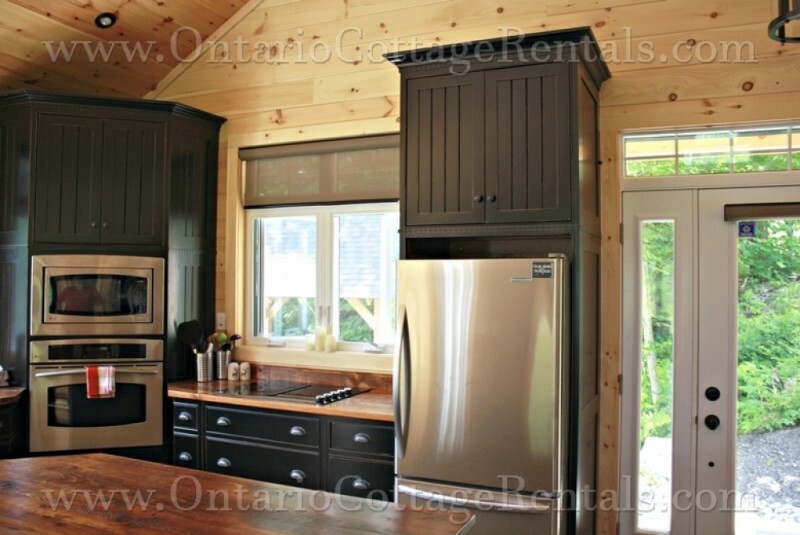 The kitchen is equipped with high end appliances such as stainless steel fridge, extra large microwave, oven, down draft cook top and dishwasher. 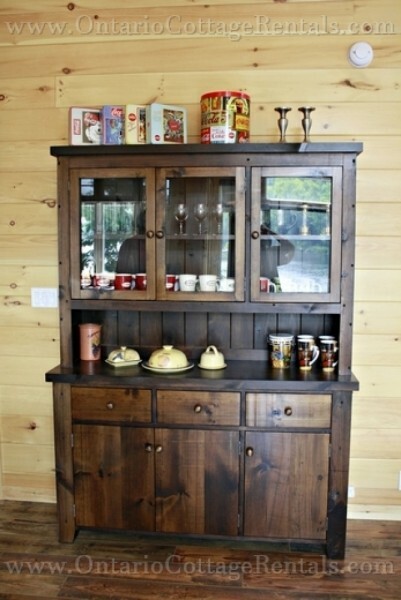 The kitchen island, with lots of cupboard and drawer space, along with a wine rack, has seating for two, with an extra stool. 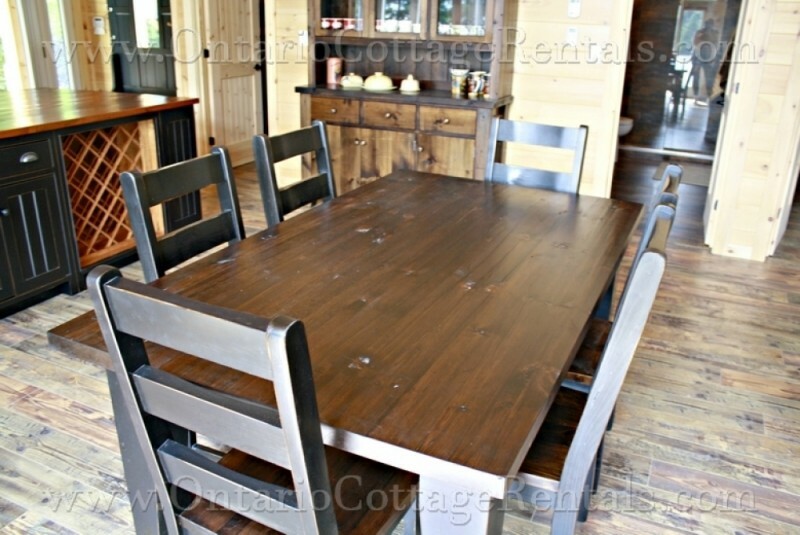 The dining table will seat eight. 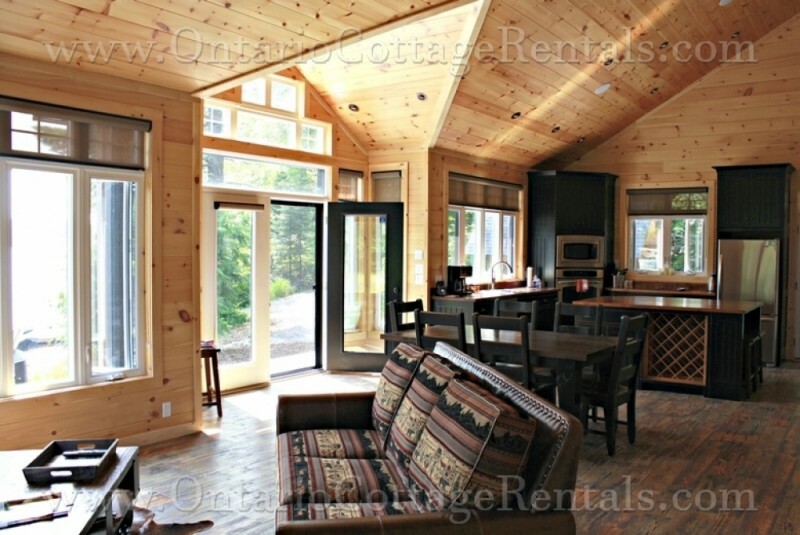 The living room is bright and airy with comfortable seating where guests can enjoy the 50" wide screen satellite television mounted over the propane fireplace. There is a BOSE surround sound system through the main living area (not in bedrooms) as well as speakers outside. Cell reception is very good, and WIFI is available to keep in touch with your world back home. 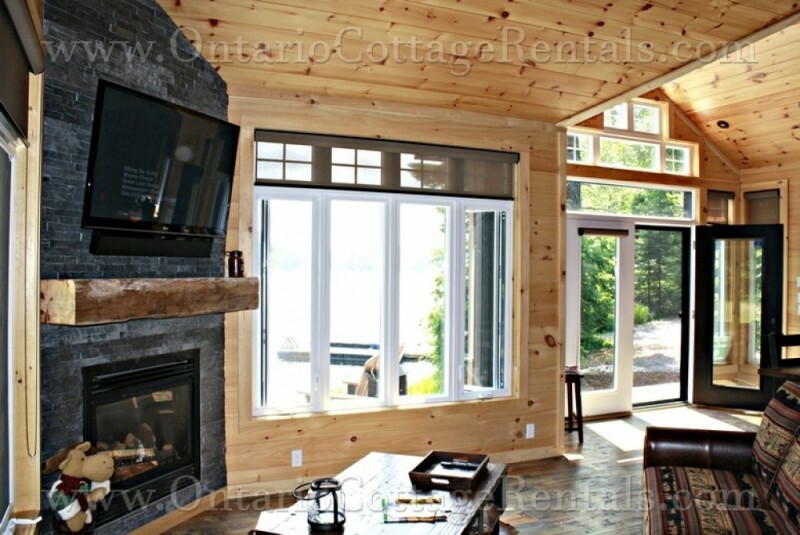 There is no air conditioning, but when the windows are open, cool breezes from the lake keep the cottage cool. 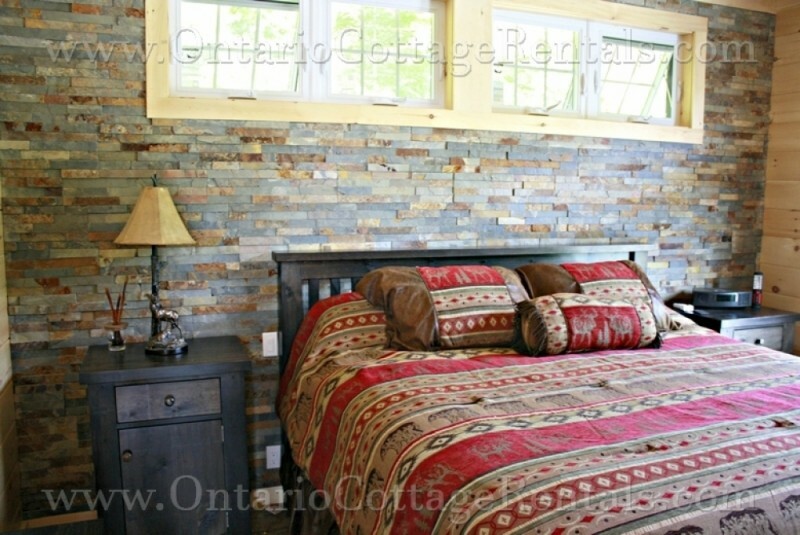 The first bedroom has a king-size bed with walk-out patio doors leading to both the deck and the fire pit area. A ceiling fan will keep the cool air circulating. 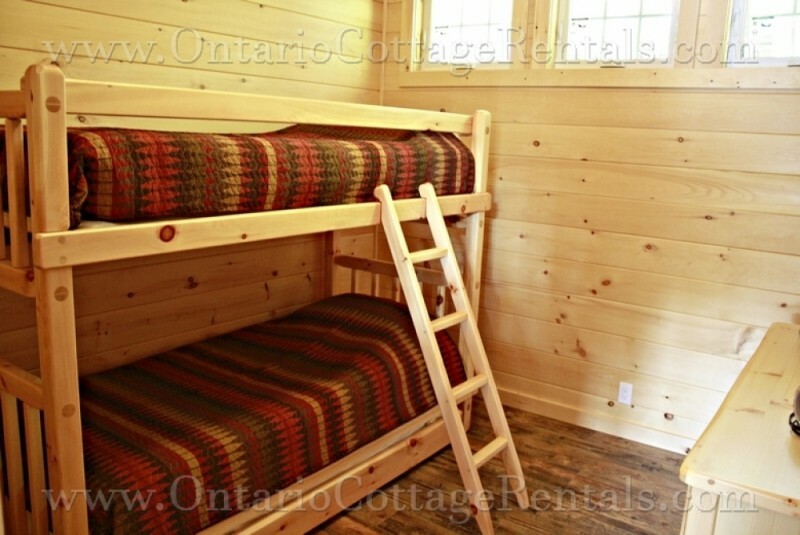 The second bedroom has a set of extra long single bunk beds, with a trundle bed that would sleep three people total. Because of the size of both beds, the linens are supplied. 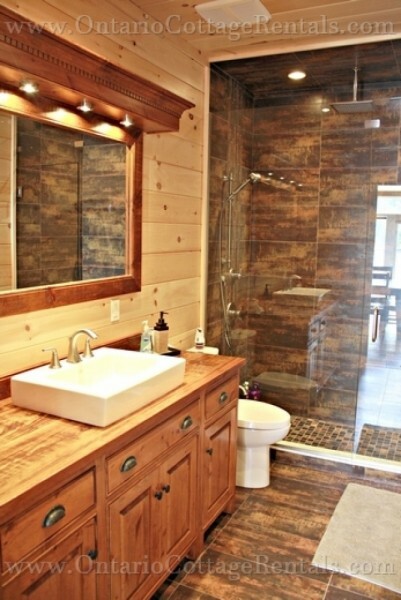 The bathroom is a three-piece with sink, toilet and extra large shower. The floor is porcelain tiles, again with in-floor heating. 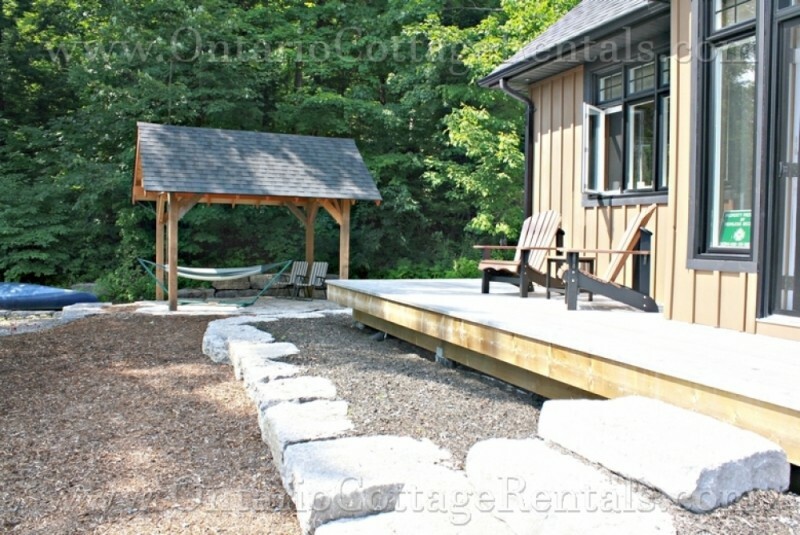 The deck runs along three sides of the cottage, with several Muskoka chairs and side tables in different areas. 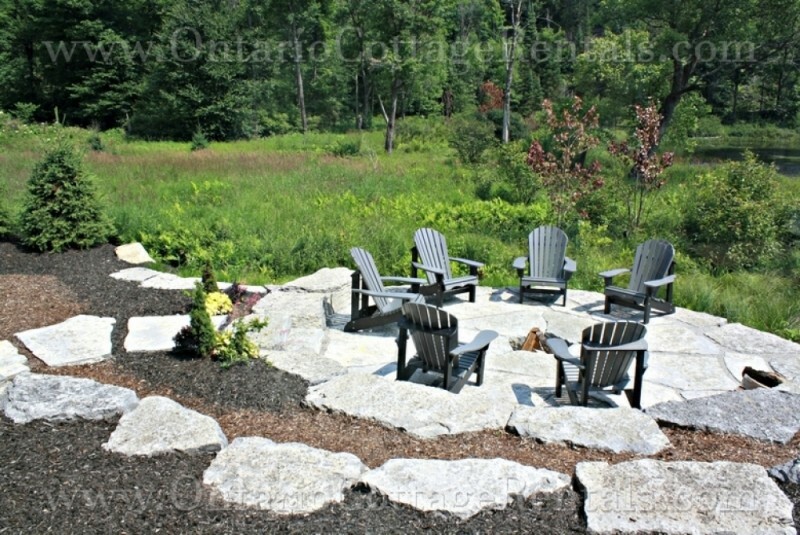 The beautiful in-ground fire pit has another six Muskoka chairs around it, for relaxation around the camp fire after a long afternoon of swimming. There is a paddle boat and canoe provided for your pleasure. 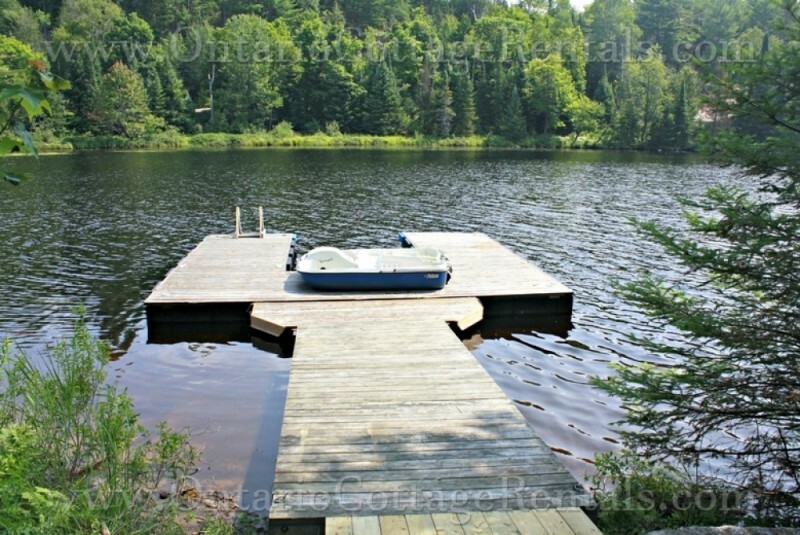 The dock is U-shaped and the water at the end is approximately eight feet deep. 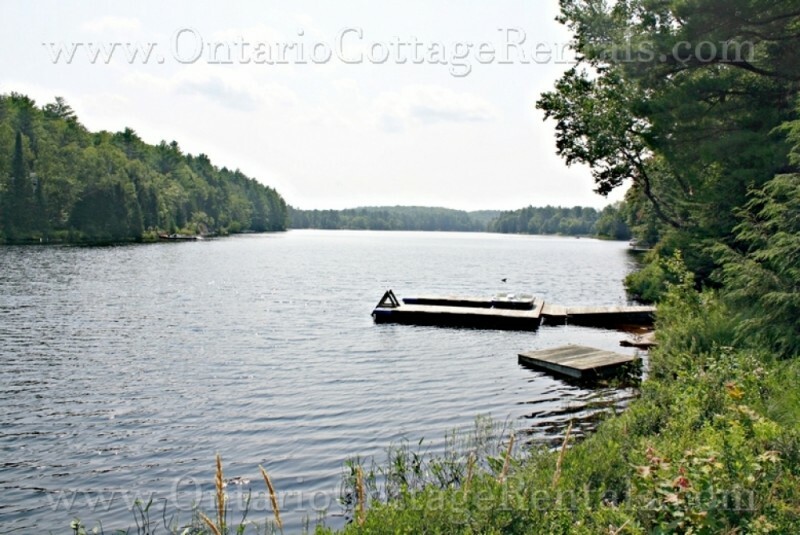 Although some of the waterfront is weedy and grassy, there is a small beach with a sandy bottom providing good swimming. High-Season includes the last full week of June to Labour Day Monday. 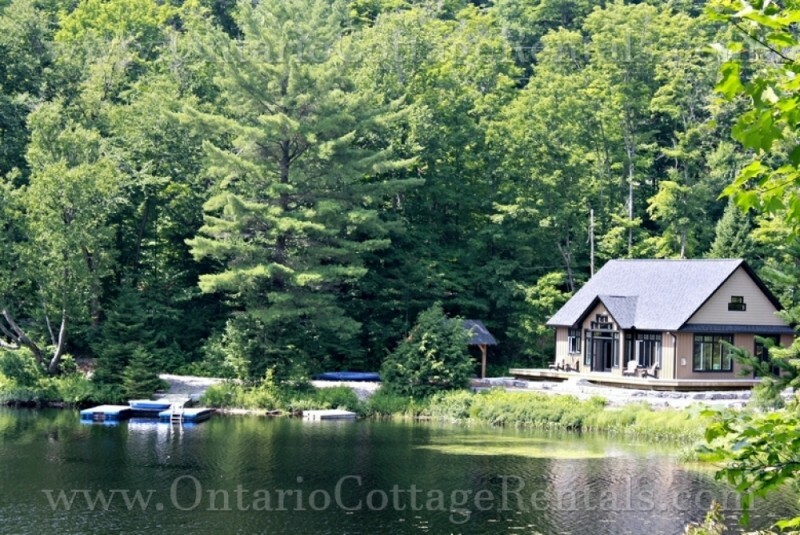 $1,175 per Holiday & Regular Weekends in Off Season - 3 Night Stay. $1,000 refundable security deposit required.